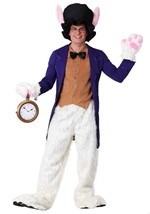 This adult cotton/polyester White Rabbit costume hat is ready for a night on the town! The soft, felt-like black hat has an attached checkered felt band, bowtie, and attached faux fur ears. A sliding adjustable strip inside the rim ensures a comfortable fit. Once the size is adjusted to your preference, a Velcro attachment secures the strip in place. Hat has a 2 1/2 inch brim with an overall diameter of 13 inches and measures 9 inches from brim to top. This is an officially licensed Alice in Wonderland costume accessory.